Oooey Gooey Peanut Butter Crunchy Pretzel Goodness! I don't know about you but I love those peanut butter filled pretzels. I could eat an entire bag in one sitting. My friend JoAnn at work introduced me to them and I never looked back. So when I saw a recipe for Peanut Butter Pretzel Blondies over at Veggie Girl's Blog, I just had to try it! It was perfect timing too, since it was JoAnn's birthday and I wanted to make her a tasty treat. I have to say that I have never baked using a gluten-free recipe before since I don't have a problem with gluten. But for anyone who does, Veggie Girl can hook you up with some awesome recipes. I can say this with certainty now because I finally got a chance to try one of her creations! I was kind of wondering how they would turn out, seeing that I'm used to using eggs and butter in a lot of my baked goods. I did change the recipe a bit since I don't have gluten free flour; I used all purpose flour. Also, I didn't have any peanut butter filled pretzels on hand so I followed Veggie Girl's recommendation to use crushed pretzels and peanut butter. All I can say is "HOLY YUM" to quote Veggie Girl ;) They were absolutely fantastic. The texture of the outside was nice and crisp and the inside was moist and chewy. The crushed up pretzels softened a bit inside the batter, but still provided a little crunch. Plus I added some crushed pretzels to the top for more crunchy texture. JoAnn LOVED them. Thanks Veggie Girl for your creative and yummy recipe. Line an 8"x8" baking pan with parchment paper or spray with nonstick cooking spray. Mix together the yogurt, canola oil, sugar, vanilla extract, and molasses in a large bowl. Add in the flour, baking soda, 1 1/4 cups crushed pretzels and peanut butter. Mix well. Pour mixture into the prepared pan and sprinkle with remaining 1/4 cup of crushed pretzels. Press the pretzels gently into the batter. Bake for about 32-35 minutes, until a toothpick inserted in the center of the blondies comes out clean. Annie, Annie, Annie - this post just made my night!!! You rock :-) And so does JoAnn, haha. oooh, i stared at the pb pretzels in the store with this recipe in mind!! but i haven't been to good lately, so i feared buying them would just mean i eat them before putting them into these lovelies :) soon, soon! Mmm, these pretzel blondies sound amazing. I love those peanut butter pretzels, too! I can't wait to try out this recipe. They look delicious! So glad JoAnn loved them! 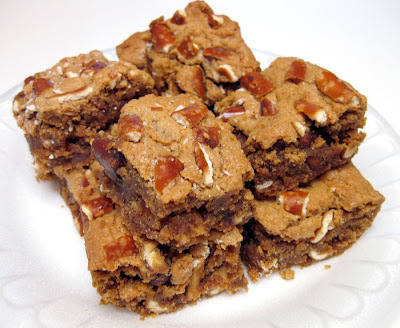 This is the first time I heard about peanut butter blondies,they look delicious .After I heard Joanncomment and saw the video I have to try some.Good job Annie,bambola. Ummm...how could these not be delicious. I am going to have to try them soon! 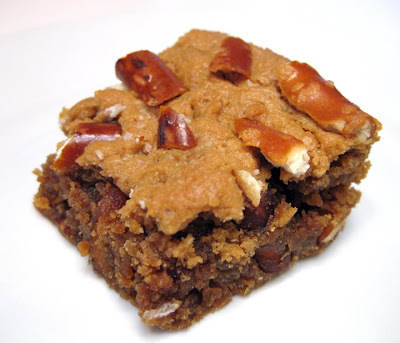 These peanut butter pretzel blondies sound terrific. Wow, I'm so impressed! YUM - well, you know I love this combo ;) Your blondies look fantastic! They look and sound divine.